Late Night (and accompanying patch) introduced the ability to move pictures up and down on walls. However, many of us were frustrated to discover that this didn't work on curtains. Well, now it does! 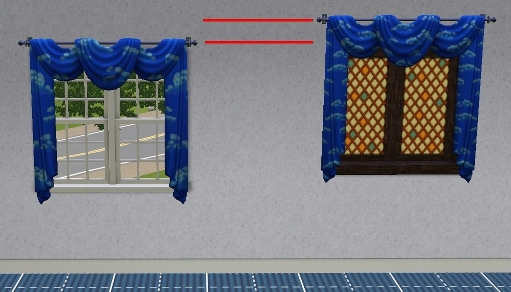 With this default replacement mod for EA curtains, you can now use any curtain for any height window. You'll get a lot more use from basic drapes. The download includes three files: one each for base game, Ambitions, and Late Night curtains. Download just the packages you need for the EPs you have. Even modifies curtains you've already hung... after installation, they'll be height-adjustable. Will not modify custom or store curtains. For those new curtains that game with Generations, see this link. Thanks Armiel! This mod updates the OBJD resources for each of the curtains. It will conflict with any other mod that changes the OBJD. Known to conflict: Curtains! Stop Snapping to that Wall! !